Ahorrarás $157.78 más (76%) si compras la edición Kindle. A gripping psychological thriller of secrets and obsession that will keep readers flipping pages to the stunning conclusion from the author whose suspenseful work has been described as "meticulous and detail-laden, with plenty of red herrings" (Kirkus Reviews). One year after her husband Zach's death, Lizzie Carter goes to lay flowers on the site of his fatal accident. Since the tragedy, she just hasn't been the same, wracked with grief and guilt and regret and...relief. Even though her friends tell her she's grieved enough for her "prince charming," her memories of a darker side of Zach that no one else knew are burned into her brain and won't let her forget him. But as she lays her flowers down at the roadside, she sees a bouquet of lilies at the foot of the tree. Addressed to her husband. She isn't the first to pay her respects...but who is Xenia? As Lizzie learns more about her husband's past, she begins to realize that maybe she didn't know Zach at all. But she's still tormented by her guilt and the memories that just won't fade...because Zach doesn't seem to be as gone as everyone thinks. And she just can't shake the feeling that he's still out there, watching her, waiting to claim her as his own once again. 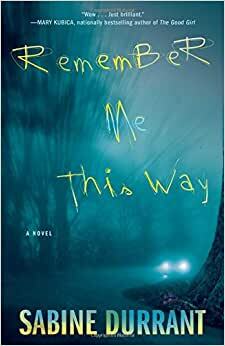 Comienza a leer Remember Me This Way en tu Kindle en menos de un minuto. had a blast reading the deliciously creepy remember me this away by sabine durrant, about a woman who starts learning the increasingly disturbing truth about husband after he dies in a late-night car crash. durrant does a masterful job of slowly kindling suspense before applying the bellows. her main character, lizzie carter, is complicated and sympathetic, and it was hard to keep my heart from breaking as her discoveries are detailed. we also get a parallel telling of events through her late husband zach's diary, which creates a really nifty perspective, perspective that deepens the characterizations of the two. utterly fantastic. 5.0 de 5 estrellasWHO was Zack? And is he still alive and threatening Lizzie? A widow looks closer into the death of her husband and, as secrets emerge, she discovers she never knew the man she married. SOUND FAMILIAR? Maybe, but then, you must read REMEMBER ME THIS WAY which twists a familiar mystery convention into a unique tale of love and deception. Then ultimately, the truth reveals obsession and murder. This is psychological mystery of the first order! Prior to his death, Zack was the "soul-mate" of Lizzie. But when she finds a bouquet of flowers from "Xenia," Lizzie becomes driven to learn the truth. SO who was Zack? The story of his early life does not hold up, Lizzie finds, as she continues her quest to delve into his past and learn the truth about the strange man she married. As Lizzie uncovers Zack's lies, she wonders if she has really stopped loving him. And another dark concern: Could he still be alive? After that fatal car crash, Zack's body was not identifiable. Then, Lizzie senses she's being followed. She fears that Zack is alive, perhaps tormenting her with little "signs" to hint of his survival. And as she learns of Zack's dark side, she feels he may be alive with the sole purpose of killing her. Even as she acknowledges her fear, she retains a fascination with the man, who was so handsome and charming, although his strange behavior after marriage was domineering and frightening. A marvelous read! Can't wait to get more from this author. Wow! I'm not going to go into detail about the actual story because I HATE when I read a review that gives away too much information. I usually keep a book to reqd while I soak in the bath, but I couldn't so that with this one. Every time I thought about putting it down my curiosity refused to let me. This book takes you through so many emotions and never gets boring. It's written like a lot of books are being written now, chapters are narrated by either the husband or the wife. It doesn't take long for the suspense to grab you and it doesn't let go until you finish the last page. I thought for sure I knew where the story was headed and expected a predictable end, but that was not meant to be. The last few chapters absolutely shocked me. I reqd this book in one sitting and although I'm glad I know how it turned out, I wish there were more pages to read. This book is told in the past/present style from the views of Zach prior to his death and Lizzie after his death. The writer does a great job in detailing the towns outside of London and the close community that does exist along with the level of dysfunction that lives inside of relationships. As you move through the story you see glimpses of ugliness and you aren't clear on what is truth and what is imagination. For me the unknown is what kept me in the book....I wanted to know who was the crazy one. 3.0 de 5 estrellasPointless to read, but not bad, just pointless. This is really the most pointless story I have gotten all the way through since I can remember. But since I did manage to get through it, that shows it is not a poorly written book, it is just incredibly pointless as a story. I have nothing negative to say about it, but I also have no reason for why anyone should read it. Thriller? More like protagonist who is simply paranoid (spoiler alert too late, sorry).